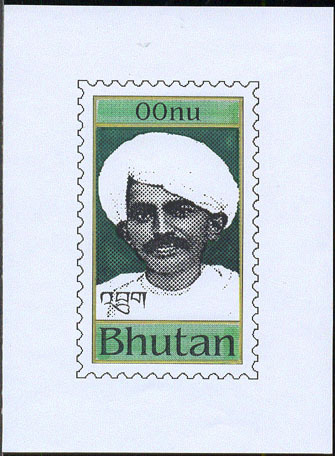 16336 MAQ BHUTAN (1990) Gandhi*. Hand-painted essay for proposed issue, 11 x 15.2 cm, produced by and artist from the South Africa Post Office Committee. Only 2 of this item were produced, one being sent to the India agent for Bhutan. Certificate of genuineness and explanation included.